Do I need a name and password for this website? Most of this website can be viewed without logging in with a name and password. However, if you click on any of the Social Network menu options, you'll be asked for a name/password because our Social Network is a "closed" community and not publicly viewable. In this way, your privacy is assured. If you would like to request a login, just fill out the contact form at the bottom of this page and in the "Comments" field tell us the year you graduated from West Seattle High School. If you're not a graduate, please tell us your affiliation with the West Seattle Alumni Association, and we'll email you your own name and password right away. Once you login, you'll have many more options in the upper-right corner of your screen. If you uploaded your photo on your profile page, you'll see your photo in the upper-right after logging in. Just move your mouse over that area and you'll see all the many places on the Social Network that you can explore. How do I submit articles or request updates to the site's calendar? If you have an article you'd like to submit, or would like to request an update to the site's calendar, just fill out the form at the bottom of this page...one of our moderator's will get back to you right away. Who do I contact if I think something needs changed or updated? BuddyPress forums are designed to allow groups to create and manage their own forums; it doesn’t provide a discussion forum for the entire network (so you will use the forums as discussion areas within groups you belong to...see the FAQ on "groups"). 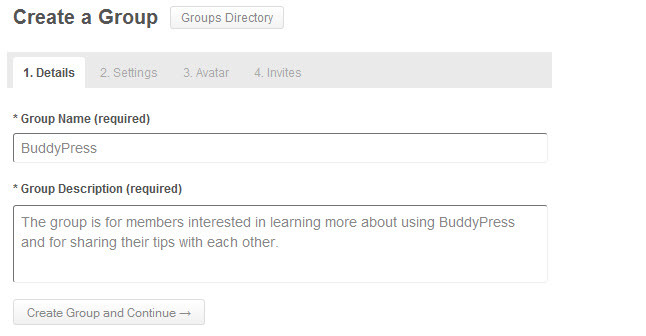 However, members can easily search all public forum topics using the BuddyPress Forums Directory. Any member can post reply to a forum post or start a forum topic in any public group, even if they aren’t a group member — adding a post or replying will auto join them to that group. Forum topics don’t displayed on the Forum Directory until a group has been created and a forum post has been added to the group. In other words, forums are created in the "Groups" area of our Social Network. When you create a group, you'll be asked if you want to associate a forum with the group...by saying "yes" to that option you'll automatically create a forum for the group which will conveniently be seen in the "Forums" section of our Social Network, which everyone can post to and read. However, groups can be created and then have a forum associated with in any time in the future. To do this, simply go to the Groups section and open your group. Then click "Admin > Forum" and you'll be able to add a forum to the group. Be sure to read the "How to Create a Group" which gives a step-by-step set of instructions to get your group's forum up and running. The Forum Directory lists all forum topics, by all Groups, created within the community, sorted by the most recemtly active. Forum topics can easily searched or be filter (by Last Active, Most Repies and Unreplied). Important !!! If you click on a forum and it takes you to a page that says the forum does not exist, there's a quick fix for that. Go to the "Groups" section ("Social Network > Groups") and open your group. Find the tab towards the right which is labeled "Admin" ... click it. After you click "Admin", click on "Forum" just below. Now, put a "check" next to the phrase "Yes. I want this group to have a forum." ... Now, just wait a few minutes and your forum will be active. You can now see the forum by clicking "Forums" under "Social Network" on the Top Menu. 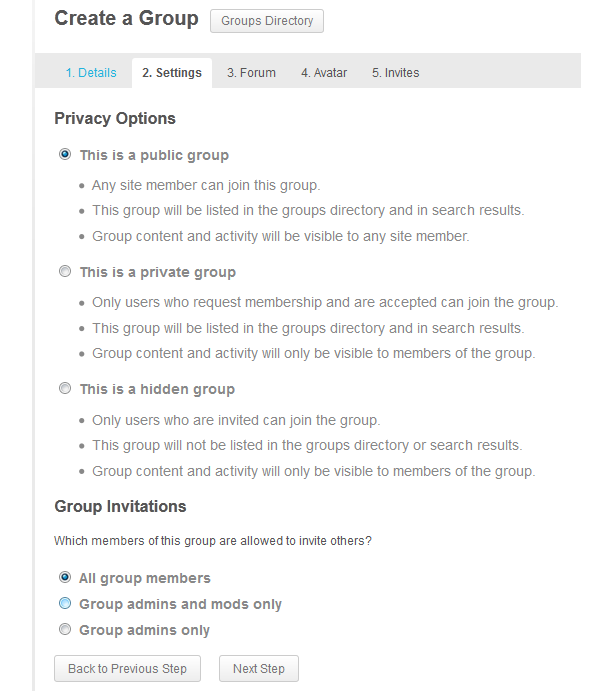 Any member can create their own public, private or hidden (invitation only) group on our Social Network using the "Create a Group" link in the Groups Directory. The Groups Directory is accessed by clicking on "Groups" under "Social Network" on the top navigation menu or using the "Group" link under Howdy, User in the toolbar at the very top of your browser. It lists all groups from most active to least active, displayed as 10 groups per page. Groups in the Directory can easily be searched or filtered (by Last Active, Most Members, Newly Created or Alphabetical) to find that groups that most interest you. 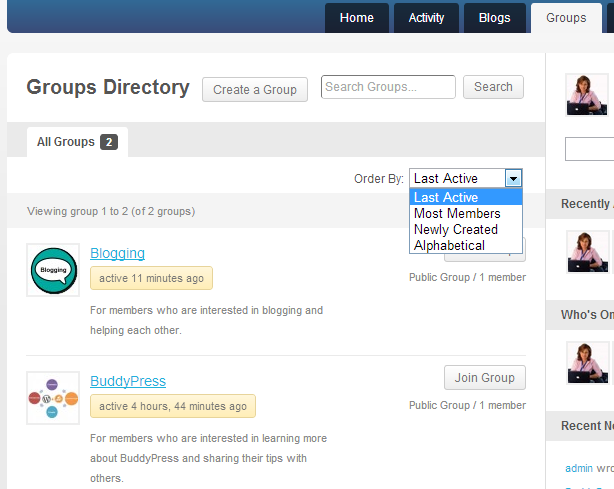 You can also join and leave a Group using the Groups Directory page by clicking on Join Group or Leave Group. 1. 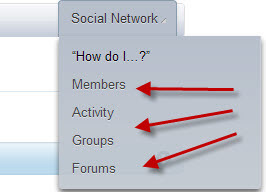 Go to the Groups Directory by clicking on Groups under "Social Network" on the Top Menu. Add your Group Name and Group Description — be descriptive enough so other members can understand the purpose of your group. 4. Choose your Group Settings Privacy option and the click Next Step - select either to create a public, private or hidden (invitation only) group. 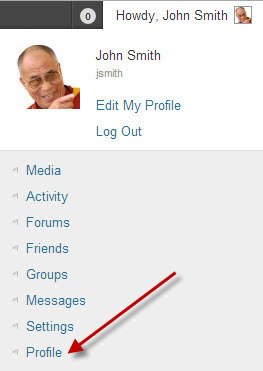 On the next step you'll have the option to add a forum to your group. This would be the time to create a forum if you want one. 5. 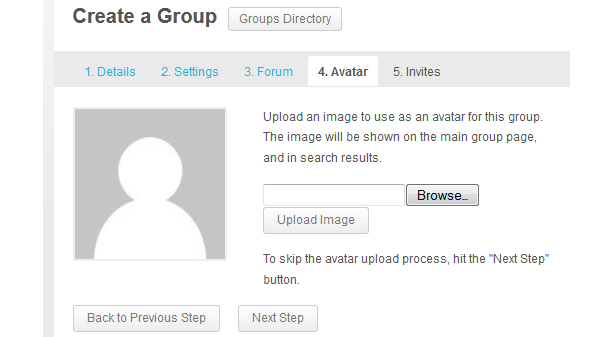 Upload your Group Avatar (optional) and then click Next Step. 6. Send Group Invites to people from your friends list (if you want) and click Finish. Pesto! You’ve created a group! Important !!! If you are creating a group and adding a forum to it, there is one final step to activate the forum. Open your group and find the tab towards the right which is labeled "Admin" ... click it. After you click "Admin", click on "Forum" just below. Now, put a "check" next to the phrase "Yes. I want this group to have a forum." ... Now, just wait a few minutes and your forum will be active. You can see it by clicking "Forums" under "Social Network" on the Top Menu. Groups are related to "Forums"
Our forums are designed to allow groups to create and manage their own forums; it doesn’t provide a discussion forum for the entire network (so you will use the forums as discussion areas within groups you belong to...see the FAQ on "groups"). Forum topics don’t displayed on the Forum Directory until a group has been created and a forum post has been added to the group. In other words, forums are created in the "Groups" area of our Social Network. When you create a group, you'll be asked if you want to associate a forum with the group...by saying "yes" to that option you'll automatically create a forum for the group which will conveniently be seen in the "Forums" section of our Social Network, which everyone can post to and read. However, groups can be created and then have a forum associated with in any time in the future. To do this, simply go to the Groups section and open your group. Then click "Admin > Forum" and you'll be able to add a forum to the group. Our Social Network is built with "Buddypress", so you can find more info about Groups and Forums by doing a Google search on "how to use groups on Buddypress". What's the easist way to get started using the Social Network? How to Get Started Using the WSHS Alumni Association "Social Network"
Once you've logged in, look to the upper-right of your screen and you'll see your name, as well as your profile picture (if you've uploaded one in the "Profile" section). How private is this site's Social Network? The WSHS Alumni Association has its own "private" Social Network. The only people who could ever see anything posted on your Social Network would be individuals who have a login name and password (that can only be issued by one of the moderators). Needless to say, only individuals directly affiliated with the WSHS Alumni Association would ever be given a login name and password. So, rest assured that your Social Network is a completely private and tightly-knit community. Does anyone monitor or moderate our Social Network? When I view other members profiles, I see a button called "Mention this User"...what does that do? If you click that button, you're taken back to your profile area where you can type something "about" that user (maybe a compliment regarding the photos they shared). That message will be posted to your "Activity" section, and that user will be notified that you "mentioned" them. When they are notified that you mentioned them, they'll have a link to take them directly to your "mention" so that they can easily read what you wrote about them. Also, in that user's profile a reference will be added under their "mentions" tab. It's just a fun way to visually see what people are saying about each other ... another way to "see the connections" within your Social Network. How do I upload photos, videos and music? This guide will help you learn more about "BuddyPress Media" (the program we've installed for you, which makes it easy to upload and share your photos, videos, and music) and how to use it’s features. . You can upload photos (.jpg and .png and .gif files), music (.mp3's) and videos (.mp4 only) and share them with your community. You need to go to your profile page (Hover over the word "Howdy" in the very most upper-right corner of your screen, and then click "Profile"). Next, select the “Media” tab. Now select the file you wish to upload. It can be either a picture, music or a video file (music needs to be in .mp3 format and video files must be mp4's. Note: If you upload a single file, by default your uploaded file will be placed in the ‘Wall Post’ album. 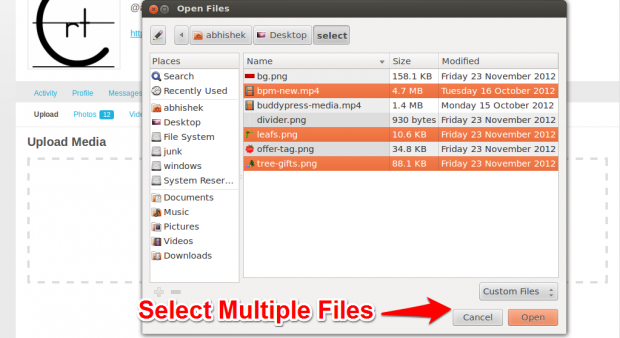 You can create an Album by uploading multiple files together. Upload pictures, music and video in one single album. Go to “Media” tab, select Upload tab. Now select all the files you wish to upload. 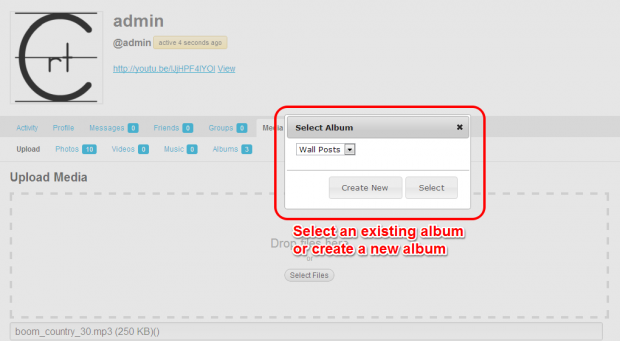 Next you will get an option to select an existing album or create a new album for the files your wish to upload. By default all your uploads are placed in the ‘Wall Post’ album. After you've uploaded your files, open them by "clicking", and when you see it displayed, look for a small option below it that says "Edit". Click on "Edit" and you'll be able to add several sentences of description for your viewers to read. What's the easist way to create albums for others to see? 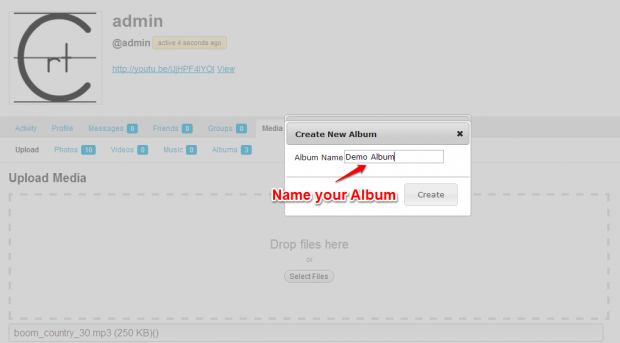 Here is a small guide on how to make new albums with "BuddyPress Media". "BuddyPress Media" is a program installed on our site to facilitate the easy uploading and sharing of photos, videos, and audios. 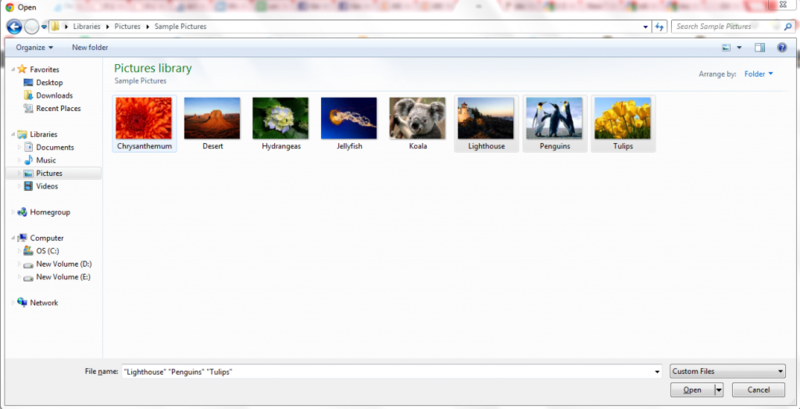 Then select the files you want to upload in your album. 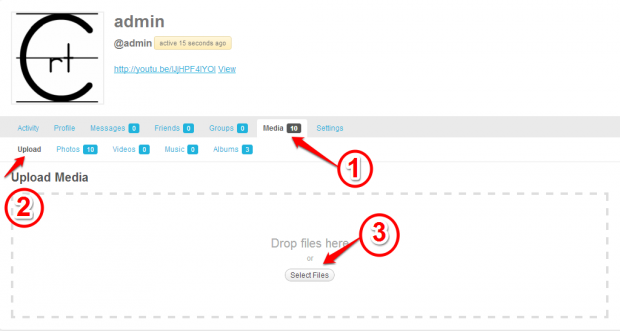 You will now see an option to select the album in which you want to upload. Alternatively you can also create a new album. If you chose to create a new album you will see the following screen where you can name your album. Once you give your album the desired name, you should see the following screen. You can see in this screen that the files are getting uploaded. You should now be able to see your new album with the images uploaded in that specific album. After you've uploaded your files, open them by "clicking", and when you see it displayed, look for a small option below it that says "Edit". Click on "Edit" and you'll be able to add several sentences of description for your viewers to read. Do I need to shrink (optimize) my photos to conserve space before uploading them? Many websites require members to "shrink" or "optimize" photos before uploading them. We've taken the burden of that off of your shoulders by the use of technologies that automatically format your photos for "web viewing"...no muss, no fuss! Although your photos will be automatically resized, we ask that you don't upload hundreds of photos at a time...but feel free to upload all the photos that you REALLY want to share. Is your question not answered here? Just drop us a note and we’ll get right back to you ! If you’d like one of our support staff to call you, just fill out “Phone” field below, otherwise just leave it blank. If you would like to join our Social Network and need a login name and password, please fill out this contact form and in the “Comments” section tell us the year you graduated from West Seattle High School, or if not a graduate, in what way you are affiliated with the West Seattle High School Alumni Association.